Do you already have an ID? New information will be added on this page at anytime. Please visit this website regularly. ★Please read the Important Notice in the "How to register" section at the bottom of this page first because it contains instructions of the management of your account and registration. ★If you are concerned about the safety and security of our registration site, please read 7, 8, and 9 of "Personal Information Protection Policy" which is listed at the bottom of the left side menu. New training fees will be effective from March 12 since the training days are changed from 5 to 4 days in relation to closing day of Budokan and Karate Kaikan. To check the new schedule, please scroll down until you will see the schedule table. ■ The name of this event has been changed to the 8th Okinawa Traditional Karate Ceremony from Budosai as of January 24. ■ IOGKF non-members to participate in 8th Okinawa Traditional Karate Ceremony, obtaining the Letter of Approval is required before the registration on this site. Please click here and read the instructions carefully. ■ Deadline for Early Bird registration: Tuesday, April 30, 2019. ■ Registration opens on October 30, 2018. 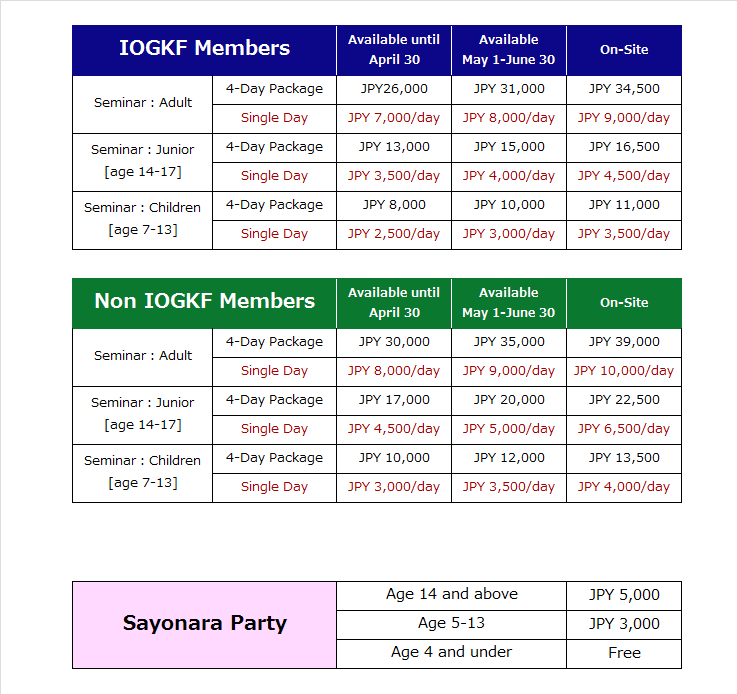 Please go to the official web site of IOGKF for more details. Registrations and accommodations are handled by Nippon Travel Agency Okinawa. to create your own account first. 2. After creating your account, you can proceed to registration of yourself and accompanying persons and hotel reservation. 1). If you cannot login, please contact us at budosai2019@ntaoka.co.jp. Do not create another account as duplicate accounts often create other problems. 2). Please note that you are responsible for updating your personal information and modifying your registration and/or other reservations. To edit the personal information of your own and/or accompanying persons, please click "Edit Personal Account Information" above the "LOGOUT" button. ※Your personal account and accompaying person's account cannot be deleted once they are created, but you can modify the information from "Edit Personal Account Information." ★To change and delete registered information, to confirm payment/refund transactions, or to print out the invoice or confirmation sheet, please click here for instructions. automatically. Please check the reservation details. 4. Please click "Payment" on the left menu and confirm the details. For Early Bird prices please be sure to make a payment by Tuesday, April 30, 2019. 5. Please click "Confirm/Change" for any cancellation, or for changes in dates or payment procedure. 6. For further inquiries, please feel free to contact us. Nippon Travel Agency Okinawa Co., LTD.